CIUDAD JUAREZ (Reuters) – Mexican President Andres Manuel Lopez Obrador said on Wednesday there were no “serious problems” at the U.S.-Mexico border after commercial traffic slowed at several crossings. Mexico’s Foreign Minister Marcelo Ebrard is in constant communication with U.S. authorities to avoid conflict and to keep the border open, Lopez Obrador told reporters at his regular morning news conference. “It’s not in anyone’s interest to close the border,” he said. U.S. President Donald Trump has threatened to close the U.S. southern border to fight illegal immigration, despite pressure from companies worried that a shutdown would hurt supply chains and $1.7 billion in daily trade. 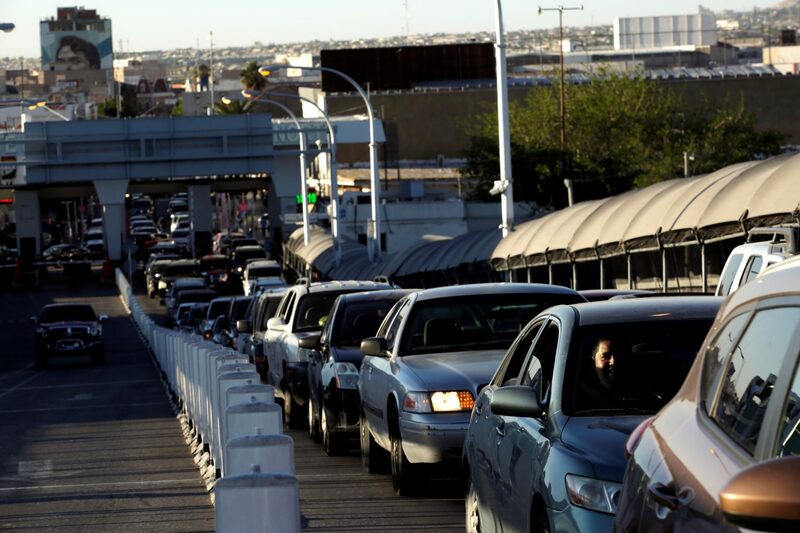 A transfer of U.S. border agents to immigration duties has slowed commercial traffic at three crossings, with gridlock in El Paso extending for hours. U.S. Customs and Border Protection (CBP) said on Tuesday it would suspend cargo operations every Saturday at one of its crossing points in El Paso until it has enough staff to operate fully, Mexican media reported. On Wednesday, some, but not all, lanes were open to commercial traffic at El Paso, Laredo and Otay Mesa. The longest wait stretched up to three hours at a section of the El Paso crossing, according to CBP. In Ciudad Juarez, across the border from El Paso, lines of trucks were longer than usual, according to a Reuters witness. (Reuters) – U.S. Customs and Border Protection (CBP) will pull around 750 officers off ports of entry and redeploy them to process record numbers of migrant families entering the United States at the Mexico border, the head of the agency said on Wednesday. The agency is also redirecting service personnel and expanding food, transportation and medical contracts to meet migrants’ humanitarian needs while maintaining border security, CBP Commissioner Kevin McAleenan said at a news conference in El Paso, Texas. “There will be impacts to traffic at the border. There will be a slowdown in the processing of trade,” he said. 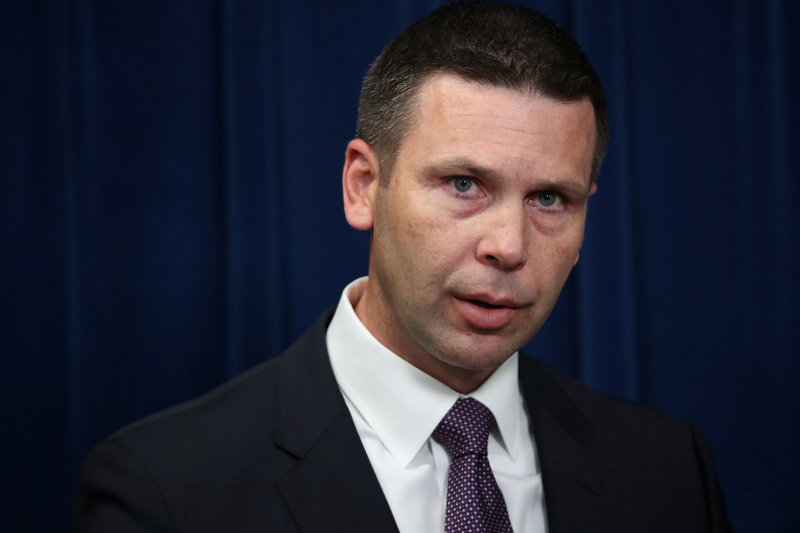 March is on track for the highest number of monthly border crossings in over a decade, with more than 100,000 apprehensions and encounters of people deemed inadmissible at U.S. ports of entry, McAleenan said. Apprehensions and encounters of families were expected to reach over 55,000 people in March, McAleenan said, the highest level for any month on record, according to CBP data. In recent years, there has been a shift in border crossings from mainly single, adult Mexicans trying to evade capture to Central American families and unaccompanied minors turning themselves in to border agents to seek asylum. Because of limits on how long children can be held in detention, most families are released to pursue their claims in U.S. immigration courts, a process that can take years. McAleenan said up to 40 percent of CBP personnel in sectors like El Paso were now working to care for migrants’ humanitarian needs. Smugglers are using the distraction of large groups of asylum seekers to traffic drugs and migrants seeking to evade capture, he said. For the first time in over a decade, CBP is directly releasing migrants into the United States when U.S. Immigration and Customs Enforcement is unable to provide bed space to relieve overcrowding, McAleenan said. 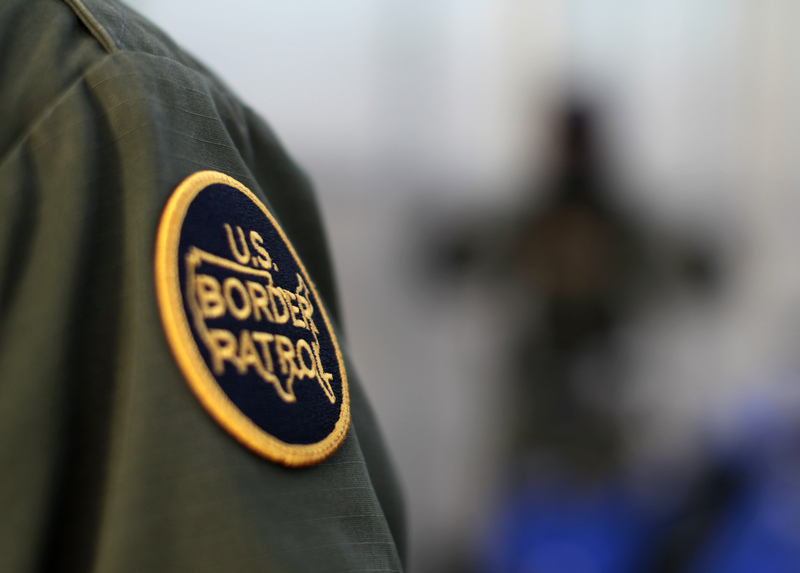 Border Patrol agents on Monday located a two-year-old Honduran child near Quemado, Texas, who appeared to be suffering from seizures and convulsions. The child was taken to the Children’s Hospital of San Antonio for more advanced care, the agency said in a statement. The hospital declined to comment on the child’s condition, due to patient privacy. Border Patrol officials were not immediately available to comment. Two Guatemalan minors died while in U.S. Border Patrol custody in December. The president has taken aim at the asylum system and earlier this year began sending a small number of migrants back to Mexican border towns to wait out their U.S. hearings. As of March 26, around 370 migrants had been returned to Mexico under the program, according to a Mexican immigration official. (Reuters) – The prototypes for President Donald Trump’s contest for a border wall near San Diego, California, were torn down on Wednesday, to make way for a new section of actual border fencing. To the president’s supporters, the eight 30-foot-high (9-meter) models were a symbol of his commitment to build a wall along the length of the U.S. Mexico border to enhance national security. To opponents, they were a waste of taxpayer money and an affront to Mexico and immigrants. “Since the test and evaluation of these prototype models is complete, they have served their purpose and are now being removed,” U.S. Customs and Border Protection (CBP) spokesman Ralph DeSio said in a statement. Using jackhammers, ladders and blow torches, military special forces and CBP special units spent weeks trying to go under, over and through the walls to test their strengths and weaknesses. 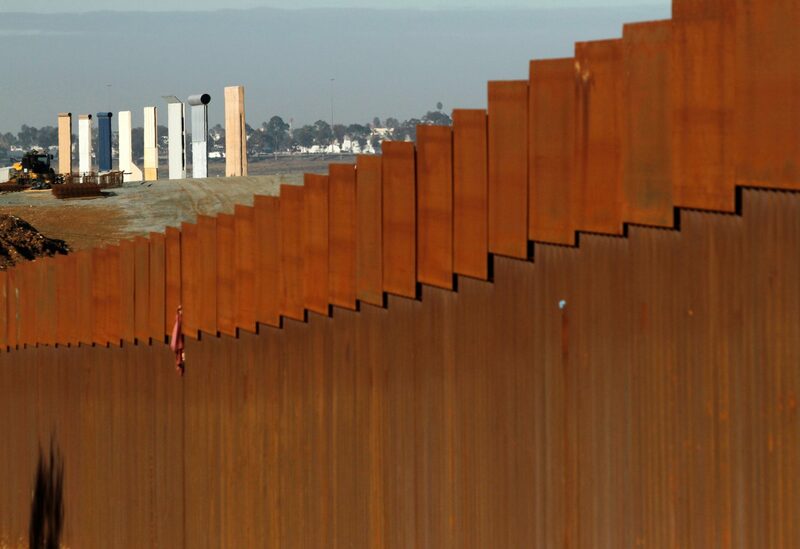 The tests of the eight prototypes, which Supervisory Border Patrol Agent Michael Scappechio of the San Diego sector said cost between $300,000 and $500,000 each to build, showed the effectiveness of the kind of steel post, or “bollard,” fence that already exists along large sections of the border. Now, a new 30-foot-high bollard fence is being built as a secondary barrier along a 14-mile (22.5 km) section, behind an existing, 18-feet-high bollard fence, Scappechio said. The ability of agents to see through a barrier is crucial to their safety, and a fence made out of steel posts or “bollards” is easier to repair when breached and relatively cost-effective, he said, while the 30-foot height is a deterrent to climbers. The fence will also incorporate fiber optic sensor, Scappechio said. WASHINGTON (Reuters) – The head of U.S. Customs and Border Protection on Sunday defended his agents’ handling of two sick children who died in their custody, saying they did everything they could to get medical help for them in difficult circumstances. The deaths have intensified the debate over U.S. immigration policy as President Donald Trump holds onto his demand that lawmakers give him $5 billion to fund a wall along the border with Mexico. The impasse over Trump’s border wall resulted in a partial government shutdown that entered its ninth day on Sunday. Felipe Gomez Alonzo, 8, died on Christmas Day. In early December, 7-year-old Jakelin Caal died after being detained along with her father by U.S. border agents in a remote part of New Mexico. On Saturday, Trump blamed Democrats for the deaths of the two children in a Twitter post, drawing criticism that he was politicizing the tragedies. The standoff over his demand for wall funding will be a test for Congress when it returns this week with Democrats in control of the House of Representatives. Trump sees the wall as vital to stemming illegal immigration, while Democrats and some Republicans see it as impractical and costly. After the death of the second child, the CBP said it will conduct secondary medical checks on all children in its custody, with a focus on those under 10. Caal was 94 miles (150 km) from a Border Patrol station when she began vomiting on a bus ride to the station, McAleenan said on ABC. He said a Border Patrol agent who was a paramedic revived her there and she was taken to a children’s hospital in El Paso, where she died. In the boy’s case, McAleenan said, it was a Border Patrol agent who first noticed he was ill and sent him and his father to a hospital. State officials in New Mexico said on Friday that Felipe had the flu before he passed away. McAleenan said the number of families and children crossing the border illegally has increased steadily in recent months and made up 65 percent of crossings in December. Those families and children are entering a system set up for adults. “We don’t want them in border patrol stations. We want them in a better scenario for these vulnerable populations that we are seeing,” he said. A border wall was the last measure listed by McAleenan as necessary to address what he called a crisis at the southern border – after new legislation in Congress, investing in Central American nations to help improve life there, and working with Mexico on a joint plan for handling migrants. Before it can hope to tackle complex immigration legislation, Congress must reach a deal on the critical spending measure. Graham on Sunday proposed enticing Democrats into supporting Trump’s border wall by offering in return a measure providing legal status for 700,000 so-called Dreamers, children who were brought to the United States illegally. “But we are not willing to pay $2.5 billion or $5 billion and wasting taxpayer dollars on a ransom note because Donald Trump decided that he was going to shut down the government and hold the American people hostage,” Jeffries said on ABC. 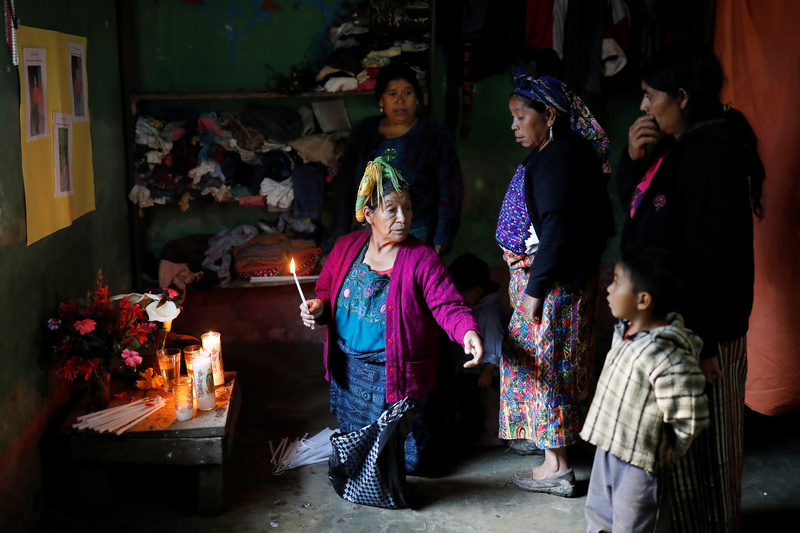 YALAMBOJOCH, Guatemala (Reuters) – Between heavy sobs, Catarina Alonzo explained that when her husband left Guatemala to try to reach the United States, they hoped taking their 8-year-old son would make it easier for the pair to get in. Instead, the boy fell ill and died. The two deaths have led to increased criticism of the Trump administration’s hardline stance on illegal immigration, as well as fresh scrutiny of why some migrants from Central America travel with children on the long, dangerous road north. Speaking at her home in a mountainous region of western Guatemala, Catarina Alonzo said neighbors had told the family that taking a child would provide her husband with a way in. “Lots of them have gone with children and managed to cross, even if they’re held for a month or two. But they always manage to get across easily,” she told Reuters in an interview. U.S. Customs and Border Protection (CBP) has yet to give an official cause of death for the boy, prompting Democratic lawmakers to intensify calls for an investigation. The Department of Homeland Security, which says that Felipe Gomez Alonzo and 7-year-old Jakelin Caal, who died on Dec. 8, were the first children to die in CBP custody in a decade, this week said it would step up medical checks of migrant children to try to prevent any more deaths. Alonzo, an indigenous Maya and native speaker of Chuj, has little Spanish and communicated through a translator. Wearing a sweatshirt and a purple dress, she spoke outside her hut in Yalambojoch, a village of about 1,000 people near the Mexican border. She related how her son and his father, Agustin, an agricultural worker, had left in early December to find work in the United States to pay off debts. The two also hoped the boy would get a better education in the United States, she said. Still, Alonzo said her husband had doubts and at one point decided he did not want to take the boy. But that upset the boy, so they resolved he should go. Alonzo’s sobs could be heard for minutes outside the house before she came out to be interviewed. Afterward she went back inside to a tiny altar she had adorned with three photos of the boy that a local schoolteacher had printed out for her. The altar stood to one side of a room with cement walls that serves as a bedroom and living area for Alonzo and her three surviving children. Adjoining it was a kitchen with a dirt floor and wooden walls. Her husband remains in U.S. custody. Marta Larra, a spokeswoman for Guatemala’s Foreign Ministry, said smugglers known as “coyotes” often encourage migrants to take children as a form of “visa.” Many coyotes, she noted, are trusted by migrant families, so their word carries weight. But Lucas Perez, the mayor of Yalambojoch, said some coyotes are only interested in ripping off people. Still, for many migrants trying to cross the U.S. border, taking a child along was the “only option,” he told Reuters. Describing migration from the area as “constant,” Perez estimated about 200 people from the tiny village live in the United States. Agustin Gomez, the boy’s father, has two brothers in the United States he hoped to meet, his wife said. Next to her hut, laborers worked on a two-story concrete house with a twin-gabled, tiled roof – evidence of the money coming back from the United States, the mayor said. U.S. President Donald Trump has tried to reverse the policy, which he calls “catch and release,” but has been blocked by lawsuits in federal court. His Democratic opponents have seized on the deaths of the two Guatemalan children to attack his policies. On Thursday, Senator Dianne Feinstein urged the Senate to hold a hearing in the new year on how children are treated in U.S. custody. In the meantime, Trump’s insistence on building a southern border wall has given coyotes a fresh argument to promote migration, Larra said. “According to interviews (with migrants), the coyotes are saying ‘it’s now or never’ because the wall is going to be built, and it won’t be possible to cross,” she said. WASHINGTON (Reuters) – An 8-year-old Guatemalan migrant boy died early on Christmas Day after being detained by U.S. border agents, the U.S. Customs and Border Protection (CBP) said, the second migrant child to die in U.S. detention this month. 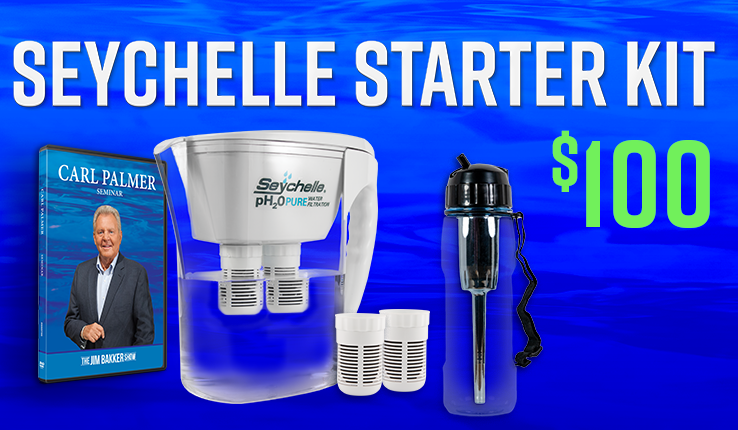 But later that evening, the boy began vomiting and was transferred back to the hospital. He died there early on Tuesday, CBP said, adding that the official cause of death was not known. The boy’s death followed the death in early December of 7-year-old Jakelin Caal, also from Guatemala. She died after being detained along with her father by U.S. border agents in a remote part of New Mexico. After the second death, the CBP announced it was developing several policy changes late Tuesday. It will conduct secondary medical checks on all children in its custody, with a focus on those under 10, the agency said in a release. The agency will also work with Immigration and Customs Enforcement to improve custody options, such as better transportation to Family Residential Centers and supervised release, and working with non-governmental agencies for housing. This is a tragic loss. On behalf of U.S. Customs and Border Protection, our deepest sympathies go out to the family,” CBP Commissioner Kevin K. McAleenan said in the release. 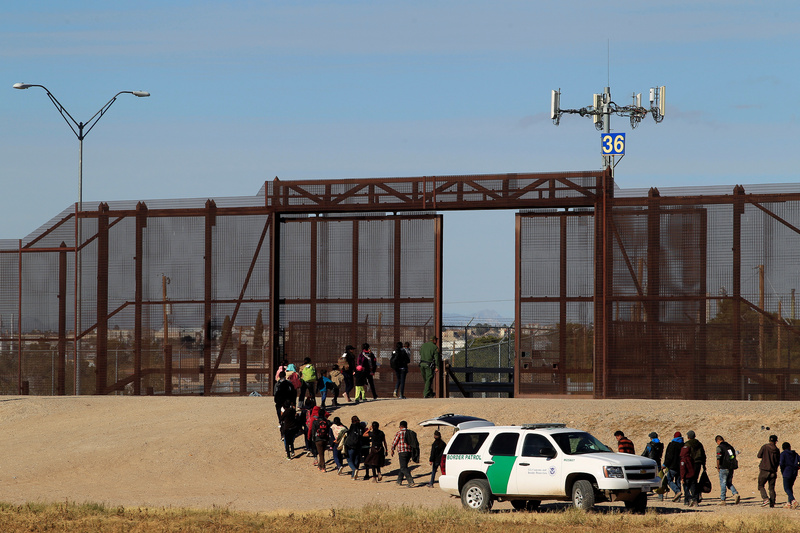 According to the ministry, the boy and his father entered the United States via El Paso, Texas, on Dec. 18 and were transferred to a border patrol station in Alamogordo on Dec. 23. Jakelin Caal’s funeral was being held in her family’s village in Guatemala. Her death fueled criticism of President Donald Trump’s immigration policies from Democrats and migrant advocates. The Trump administration said Caal’s death showed the danger of her journey and the family’s decision to cross the border illegally. That death is being investigated by the Department of Homeland Security’s Inspector General, which looks into accusations of misconduct by the agency’s employees. CBP said on Tuesday that the Guatemalan boy’s death is being reviewed by the agency’s Office of Professional Responsibility, and that the Inspector General has been notified of the death. It was not immediately known if the watchdog would open an investigation. TIJUANA, Mexico (Reuters) – U.S. authorities shut the country’s busiest border crossing and fired tear gas into Mexico on Sunday to repel Central American migrants approaching the border after U.S. President Donald Trump vowed the asylum-seekers would not easily enter the country. 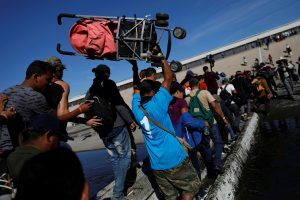 Trump has raised alarm for weeks about the caravan of Central American migrants as it approached the United States, with its members planning to apply for asylum on reaching the country. Hundreds of caravan members including women and children protested peacefully on Sunday with chants of “We aren’t criminals! We are hard workers.” As they neared the U.S. border, they were stopped by Mexican authorities, who told them to wait for permission. As the morning wore on, and it became clear they would not get permission, people started to express frustration. Groups of migrants, some of them bearing the Honduran flag, broke off and headed toward the border fence, where U.S. Customs and Border Protection officers gathered on the other side, backed by U.S. military police, San Diego police and the California Highway Patrol. 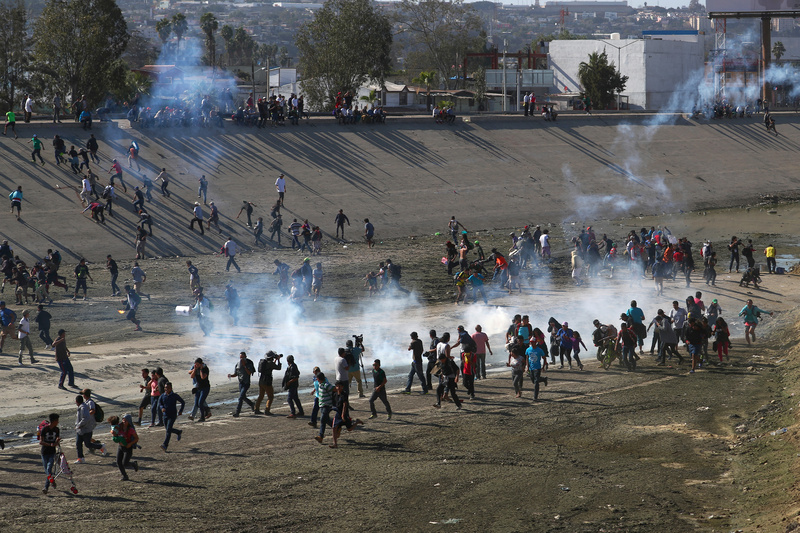 The Americans responded with tear gas after the migrants hit them with projectiles, U.S. Customs and Border Protection said on Twitter. “Border Patrol agents deployed tear gas to dispel the group because of the risk to agents’ safety,” the statement said. Protesters were caught between the Mexican and U.S. authorities. A young woman fell to the ground unconscious, and two babies cried, tears streaming from the gas, a Reuters witness said. 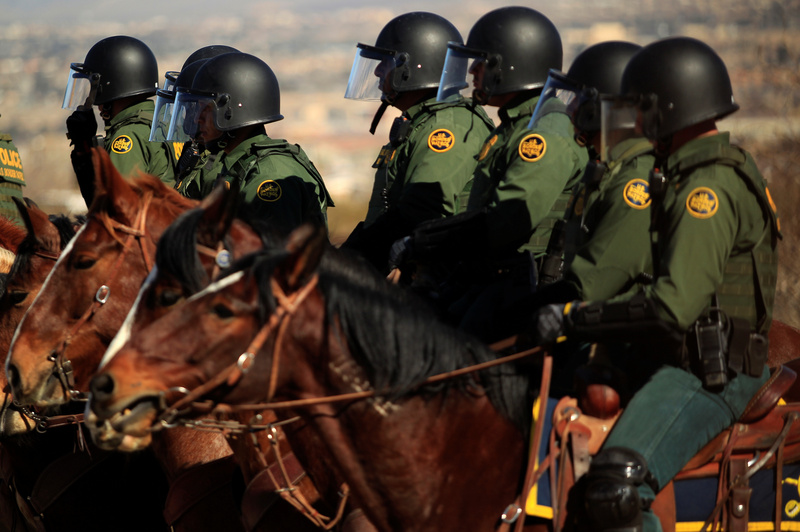 Trump has deployed military forces to the border to support the Border Patrol and threatened on Saturday to close the entire southern border. 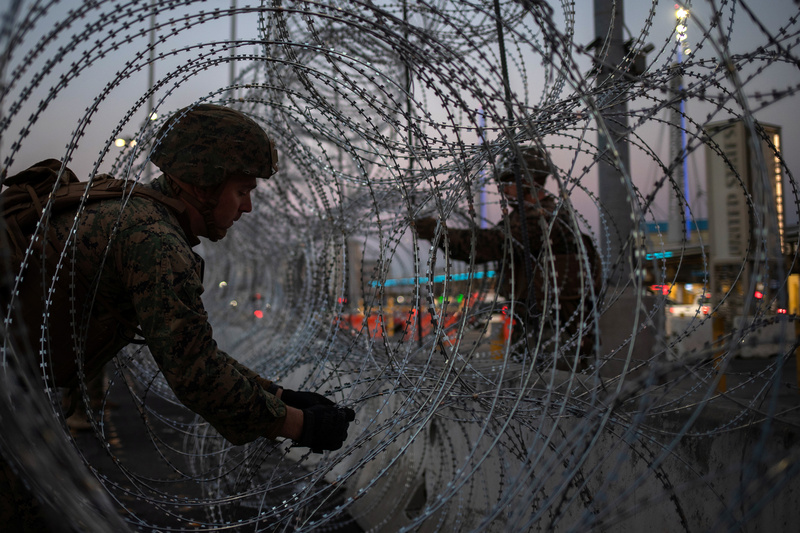 Military police were sent to the border crossing and military engineers moved barricades as part of the enforcement, the U.S. Northern Command said in a statement on Sunday. “Department of Defense military personnel will not be conducting law enforcement functions, but are authorized to provide force protection for Customs and Border Protection personnel,” the statement said. An average of 70,000 vehicles and 20,000 pedestrians cross from Mexico to the United States at San Ysidro each day, according to the U.S. General Services Administration. U.S. and Mexican negotiators met on Sunday to discuss a plan to keep the Central Americans in Mexico while their asylum claims are heard. Normally, asylum-seekers announce their intention on arriving at U.S. ports of entry or after crossing the border illegally. Trump has been pushing for a U.S.-Mexico border wall and warned on Thursday there could be a government shutdown next month if the U.S. Congress failed to provide funding. Sunday’s events took place at one of the stretches where there is a physical border barrier. WASHINGTON (Reuters) – President Donald Trump’s administration is considering giving U.S. troops on the border with Mexico the authority to carry out medical screening of migrants, U.S. officials told Reuters on Tuesday. About 6,000 Central Americans have reached the Mexican border cities of Tijuana and Mexicali, according to local officials. More bands of migrants are making their way toward Tijuana, with around 10,000 expected. In Tijuana and other ports of entry, CBP officers are trained to check migrants and travelers for obvious signs of infectious conditions, like fever, bleeding from the eyes or other symptoms of “quarantinable and communicable diseases,” according to a 2015 report by the Congressional Research Service.